The longest government shutdown in U.S. history has passed the one-month mark, and the latest polls show that the share of Americans who blame President Trump for it has grown during that time — although congressional Democrats aren’t escaping unscathed either. Meanwhile, an end to the dispute over whether to fund Trump’s proposed border wall seems nowhere in sight. Since the partial shutdown began on Dec. 22, several pollsters — specifically, Fox News, Ipsos, Marist, Morning Consult and YouGov — have been asking Americans who is most to blame for the current stalemate: Trump, Democrats in Congress, or Republicans in Congress.1 And, on average, more Americans are blaming Trump. There has been an increase of about 5 points in the percentage of respondents who say the president is responsible since the first polls were taken in December just after the start of the shutdown. But there is some evidence that congressional Democrats are also shouldering more of the blame. 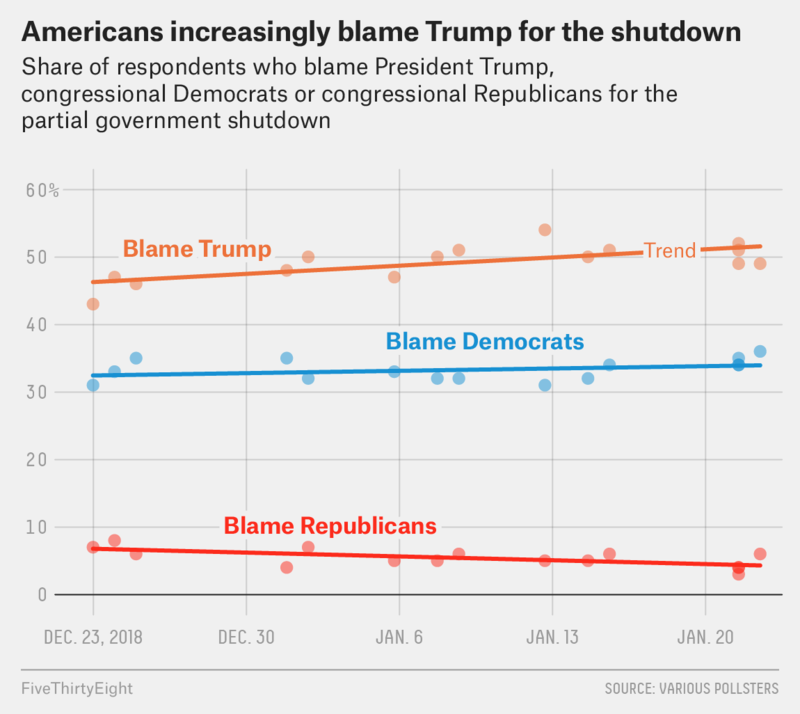 There was an average increase of about 2 percentage points in the share of the electorate that blames congressional Democrats for the shutdown. Meanwhile, the percentage who blame congressional Republicans has decreased by about 3 points. People who say they are politically independent in particular are turning against Trump. On average, there was a 7-point increase in the share of independents who blame Trump. 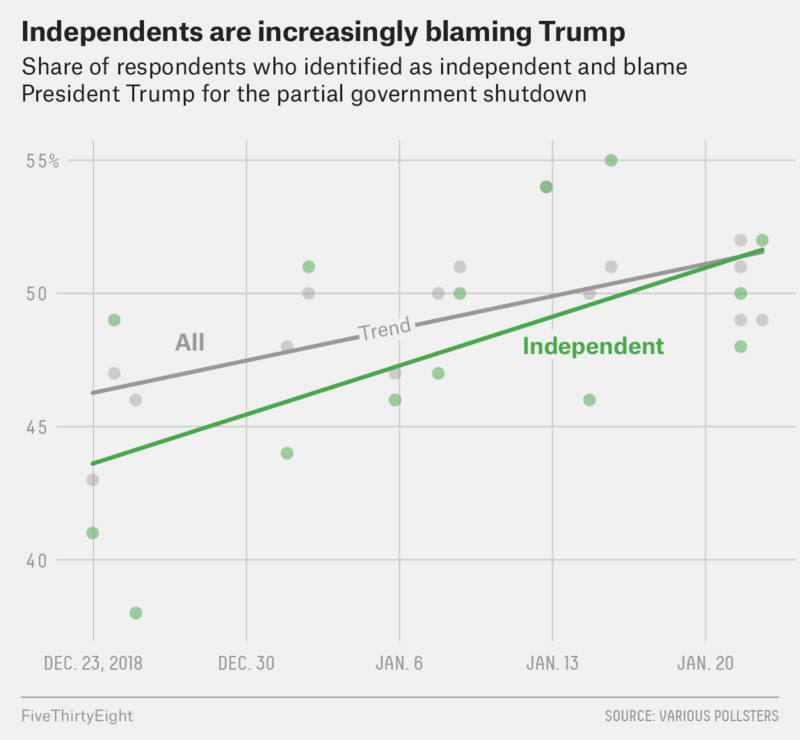 YouGov, for example, found in its most recent poll that 50 percent of independents blame Trump the most for the shutdown. That’s up 12 points from the first time the pollster asked about the shutdown and blame, in a survey conducted Dec. 23-25. For comparison, between those two surveys, the share of Republicans who blame Trump increased only 2 points, while the share of Democrats who do rose 3 points. Since the start of the shutdown, Trump has seen his approval rating decline by about 3 points and dip below 40 percent. While some polls indicate that the president might be losing support among parts of his base, Trump remains popular in his own party, pulling in approval numbers between 80 percent and 90 percent among Republicans. But the political fallout from a government shutdown might be minimal in the long run — especially considering that we’re nearly two years out from the 2020 election. So there probably isn’t a huge political incentive for either side to budge just yet. Still, we have never had a shutdown last this long, so it’s unclear whether there will be lasting electoral consequences. In the short run, it seems likely that the president and House Democrats will continue to try to win the public’s support as they pressure one another to cave on funding the border wall and re-opening the government. 60 percent of Americans say there are “plenty of jobs available in their community,” according to a Pew Research Center poll. That is the highest share of respondents with a positive view of job availability since Pew first asked the question nearly 20 years ago. A Fox News poll found that 41 percent of Americans think House Speaker Nancy Pelosi is better at “Washington gamesmanship” than President Trump, while 35 percent think Trump is better at it. Meanwhile, a poll by CBS News found that 47 percent of Americans think Pelosi is better at handling shutdown negotiations than Trump, while 35 percent think Trump is. 46 percent of women in the U.S. say they are either “very” or “somewhat” satisfied with the way that women are treated in society, according to a Gallup poll. That’s the lowest number Gallup has recorded since they started asking the question in 2001. 78 percent of Americans support encouraging highly skilled people to immigrate and work in the U.S., according to the Pew Research Center. Even among those who said the country should allow fewer — or no — immigrants, 63 percent said they support encouraging highly skilled people to immigrate. The people of El Salvador go to the polls on Feb. 3 to elect a new president. Opinion polls conducted in December show Nayib Bukele, the former mayor of San Salvador, with a lead of more than 20 points over his two biggest opponents: conservative businessman Carlos Calleja and former Foreign Minister Hugo Martinez of the left-wing Farabundo Marti National Liberation Front party. Bukele has run as a political outsider under the banner of the Grand Alliance for National Unity party after being kicked out of the FMLN in 2017. The December polls indicate that Bukele might have a chance at breaking the 50 percent threshold he needs to win the election outright in the first round of voting. According to FiveThirtyEight’s presidential approval tracker, 39.5 percent of Americans approve of the job Trump is doing as president, while 55.8 percent disapprove (for a net approval rating of -16.3 points). That’s a decline from a week ago, when 40.2 percent of Americans approved of the president and 55.0 percent disapproved (a net approval rating of -14.8 points). 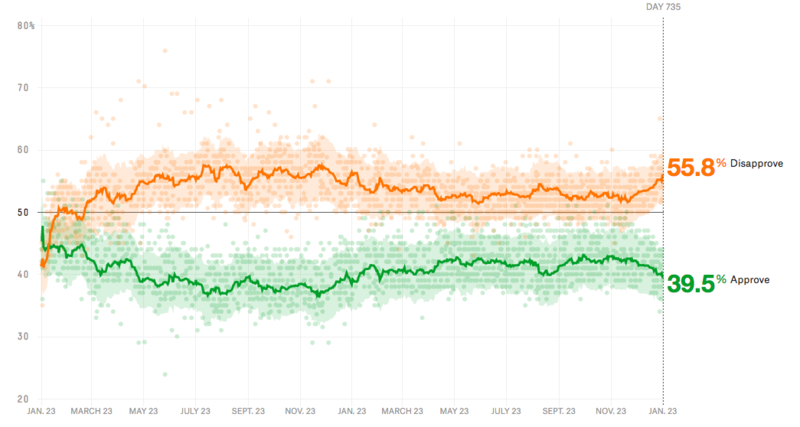 Trump’s net approval rating has dropped significantly from a month ago, when it was -11.0 (approval rating of 41.9 percent, disapproval rating of 52.9 percent). Other pollsters have asked respondents about who they consider responsible for the shutdown, including HarrisX, ABC News/Washington Post, AP-NORC, CNN/SSRS and Quinnipiac. Those polls were not included in our analysis because they were not directly comparable to the other polls. Alabama, Arkansas, Florida, Georgia, Louisiana, Mississippi, North Carolina, South Carolina, Tennessee, Texas and Virginia.